Machines Like Me is published on 18 April 2019 by Jonathan Cape in the UK and on April 23, 2019 by Nan A. Talese/Doubleday in the US. The London Review Bookshop is pleased to announce a special limited and hand-numbered First Edition of Machines Like Me, signed by the author before publication and in association with Jonathan Cape. 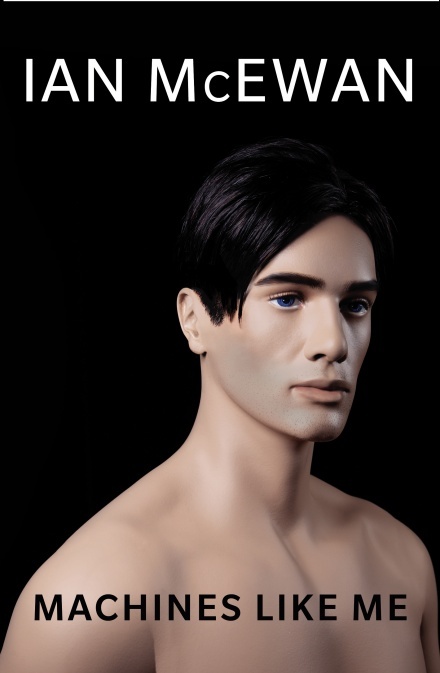 In his latest book Ian McEwan bends history with an intellectual thriller which explores the technological and moral implications of Artificial Intelligence and robotics, set in an alternative version of Britain in the 1980s. 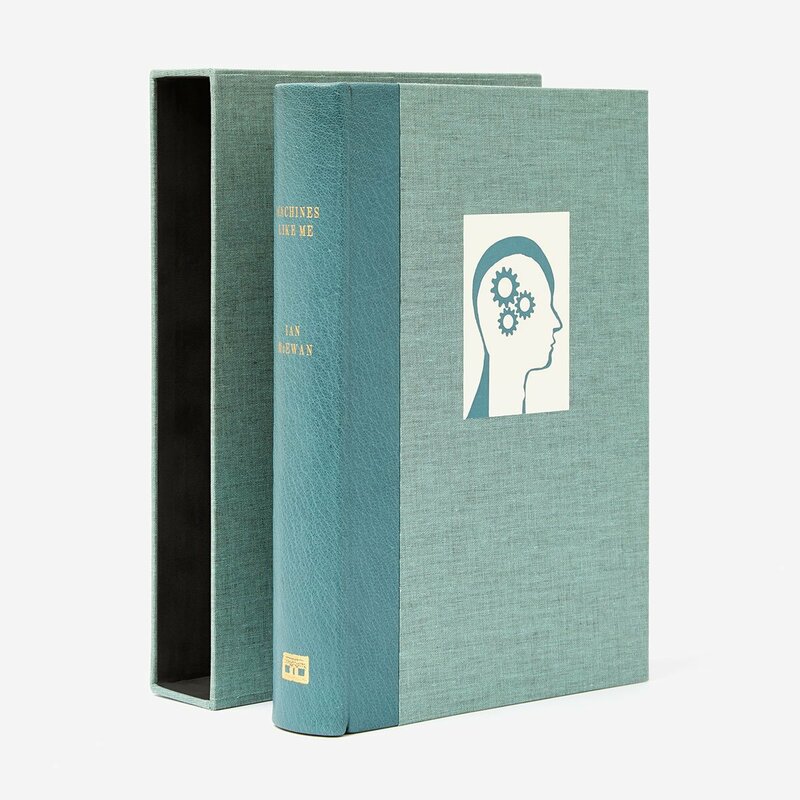 Comprising 100 copies only, numbers 1 to 75 have been quarter-bound in Harmatan fine natural grain leather (Teal 38) with design label printed by letterpress to front of book. The remaining 25 copies, numbered i to xxv, have been fully bound in the same leather with the letterpress label to front of slipcase. All copies are printed on 120 gsm Logan book wove paper in typeface Centaur and contain, in a pocket, exclusive facsimile pages of the author’s early notes for the novel. Both quarter-bound and full leather editions have head and tail bands, gold blocking to spine and are housed in a Dubletta slipcase lined in suedel. The edition has been designed by Andrew Stilwell and Patrick Roe and is produced by the Logan Press in Finedon. Publication date: 18 April 2019. For more information or to order, please visit the London Review Bookshop Website. PLEASE NOTE: All copies of the full leather edition have been sold. Ian McEwan returns to the US on tour for the first time in three years to launch his new novel, MACHINES LIKE ME. Tour stops include New York (4/29), Denver (5/1), San Diego (5/3), San Francisco (5/4), and Seattle (5/6). Ticket links are below, and all books will be pre-signed (no autographing at the events) and bundled with ticket (except for the San Francisco event, as noted below). Ian McEwan’s works have earned him worldwide critical acclaim. He won the Somerset Maugham Award in 1976 for his first collection of short stories First Love, Last Rites; the Whitbread Novel Award (1987) and the Prix Fémina Etranger (1993) for The Child in Time; and Germany's Shakespeare Prize in 1999. He has been shortlisted for the Man Booker Prize for Fiction numerous times, winning the award for Amsterdam in 1998. His novel Atonement received the WH Smith Literary Award (2002), National Book Critics' Circle Fiction Award (2003), Los Angeles Times Prize for Fiction (2003), and the Santiago Prize for the European Novel (2004). Atonement was also made into an Oscar-winning film. In 2006, Ian McEwan won the James Tait Black Memorial Prize for his novel Saturday and his novel On Chesil Beach was named Galaxy Book of the Year at the 2008 British Book Awards where McEwan was also named Reader's Digest Author of the Year. Solar won The Bollinger Everyman Wodehouse Prize for Comic Fiction in 2010 and	Sweet Tooth won the Paddy Power Political Fiction Book of the Year award in 2012. Ian McEwan was awarded a CBE in 2000. In 2014 he was awarded the Bodleian Medal. On Chesil Beach and The Children Act have recently been made into feature films. McEwan is published by Jonathan Cape in the UK and Nan A. Talese/Doubleday in the US. A selection of interviews and videos in which Ian McEwan discusses his writing, science, and other issues. Essays, lectures, interviews, videos, and other resources related to McEwan's interest and involvement with the sciences. Ian McEwan's works have been translated into over 30 languages. Learn more about his foreign publishers. Follow Ian McEwan's official Facebook page for regular updates about his publications, events, etc.